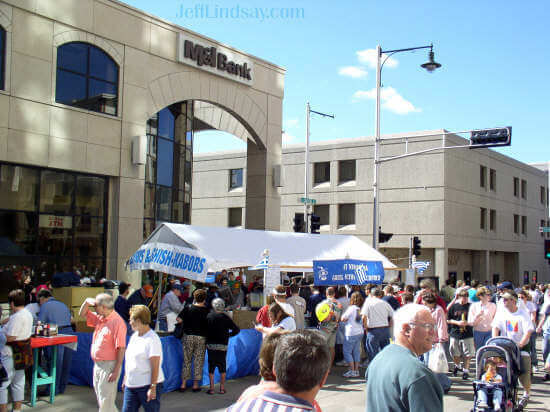 Octoberfest in Appleton is one of America's best fall festivals. 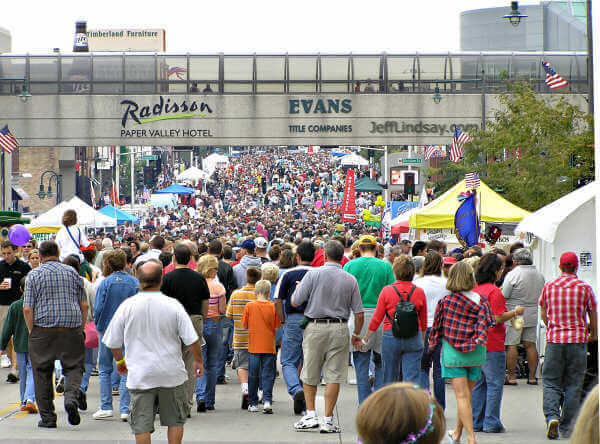 Typically held on the last Saturday in September (see Octoberfest Online for details), it consistently draws over 100,000 people for this high-class event. 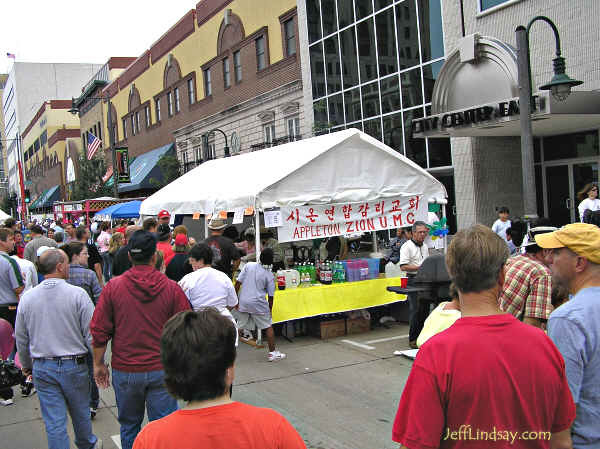 Outstanding bands andother performers offer free entertainment at several locations, while hundreds of booths line College Avenue offering food, goods, fun, information, and more. 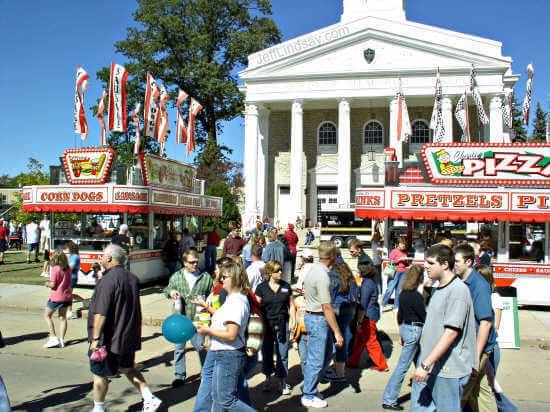 Many dozens of fine arts and crafts displays are packed on the main lawn of the Lawrence University campus along College Avenue. You can even find beverages (rumor has it that beer is offered, but I haven't seen drunks at this family oriented event). 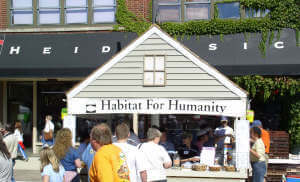 You never know what you'll see at Octoberfest, but now I'd like to share a few of the things that I saw in 2004 and 2005. 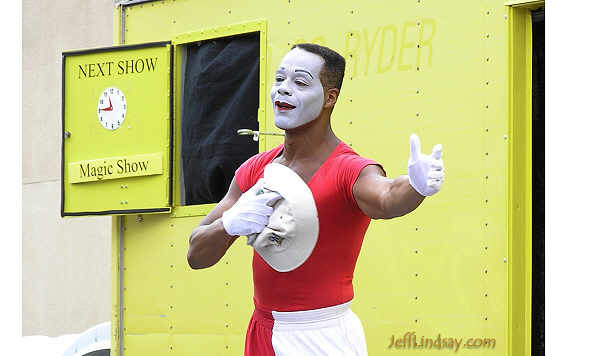 Copyright Jeff Lindsay, 2004-2005. This is one of many Apple Shots pages: down on the left are links to others such as Apple Shots #5, Apple Shots #11, or Apple Shots #15. 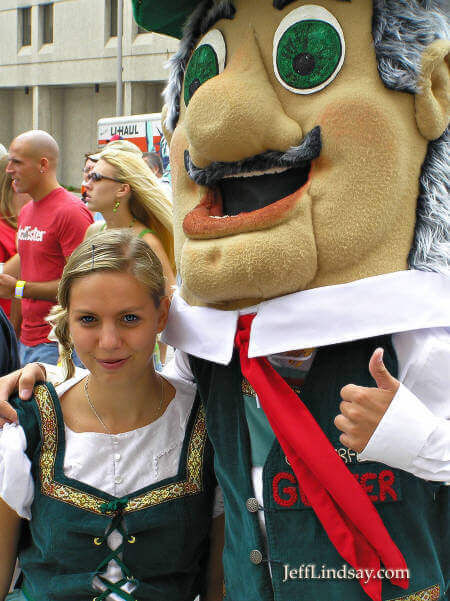 The mascot of Octoberfest, "Gunter," and and always a favorite sight. 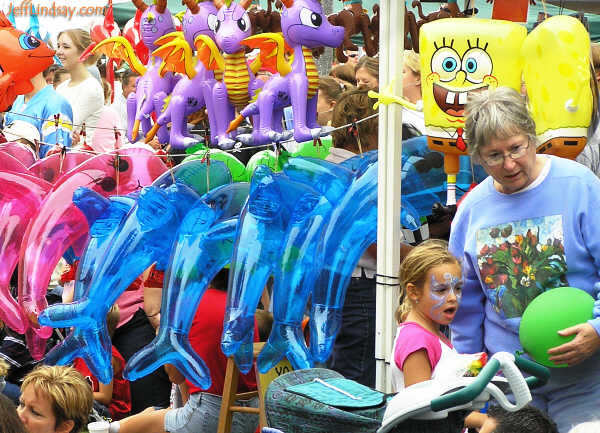 A booth selling inflatable dolphins - these can really come in handy. 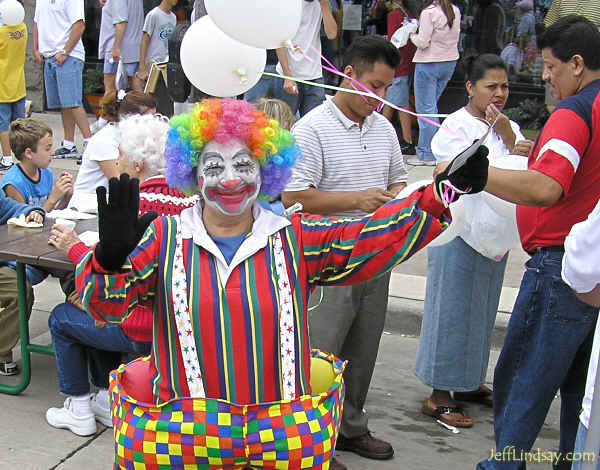 A clown at a Latin American booth. Booth from a Korean church group. 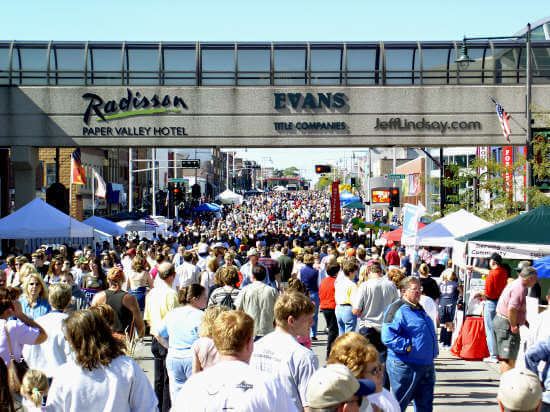 A view of the crowd, showing only a fraction of the mass of humanity that throngs the streets of Appleton for this renowned festival. 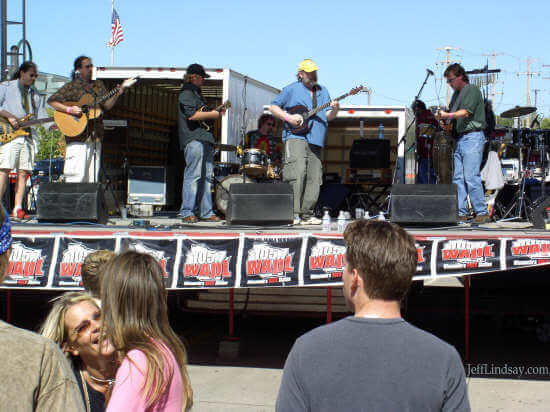 The Don Peachey Band was one of several musical groups providing free entertainment. I always enjoy watching Armenrah the Mime. 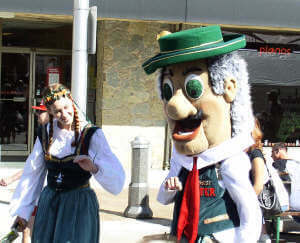 Massive crowds throng College Avenue during Octoberfest - but they are well mannered and friendly. Oh, yes - one tiny part of the overhead walkway may have been enhanced with my photo editing software. 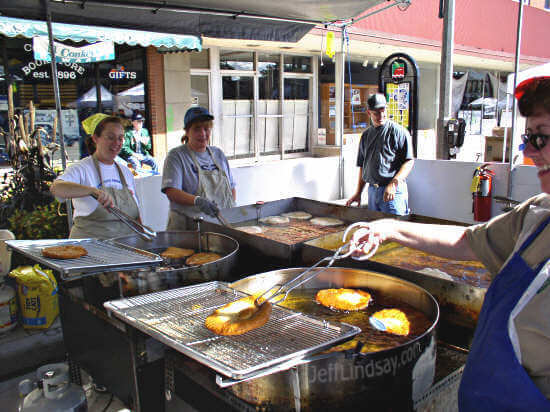 Tiger Paws - a popular sweet treat made from fried dough, provides as a fundraiser for a local Latter-day Saint scout troop. 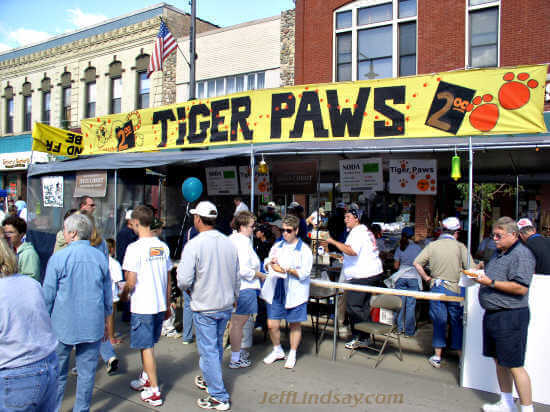 Secrets of cooking Tiger Paws. 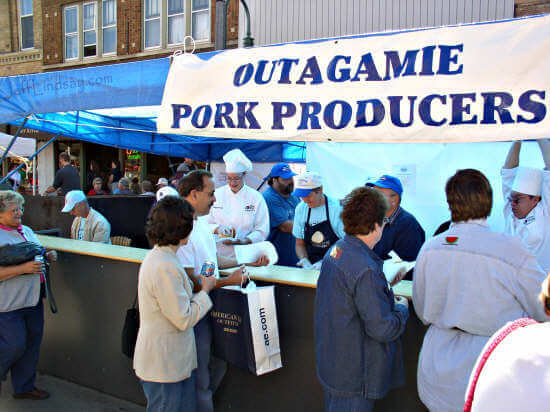 The line (not shown) for pork sandwiches was among the longest I saw. 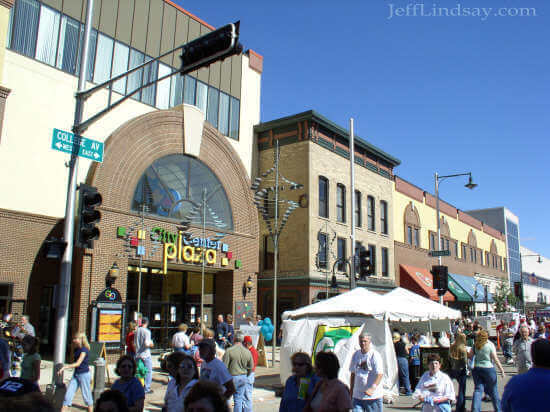 A view of City Center Plaza. 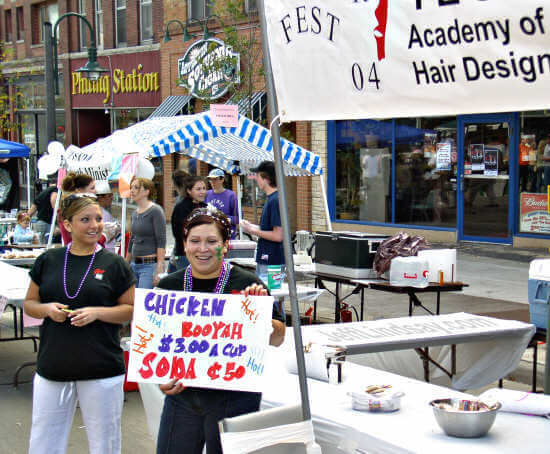 Characters from St. Mary's High School in the Town of Menasha. 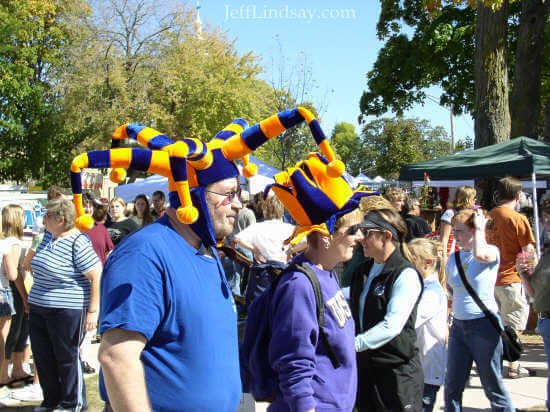 Colorful hats are occasionally sported by festive Wisconsinites. 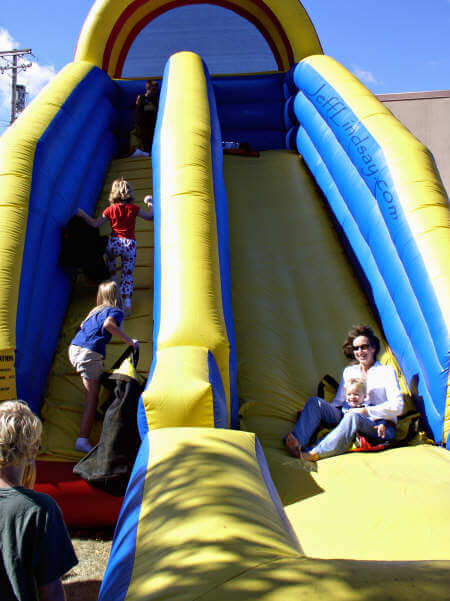 An inflated slide offers fun rides. 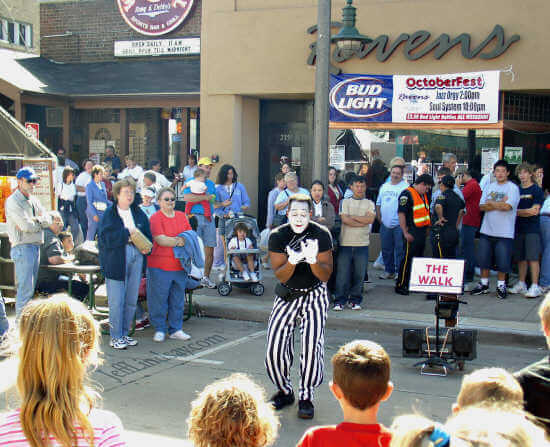 Armenrah the Mime dazzles a crowd with a brilliant performance. 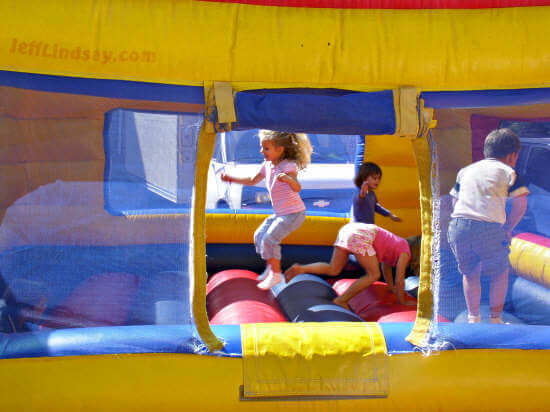 Children have fun jumping in an inflated environment. 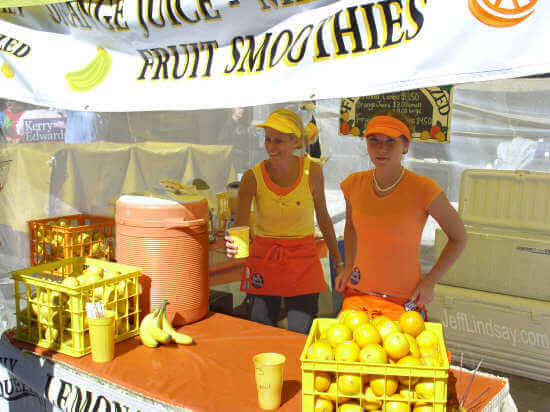 A smoothie booth provided some of the tastiest smoothies I've had. Here we see some of the finest elements of Appleton culture: sausage, corn dogs, and the classy culture of Lawrence University. The chapel shown here is the site of many cultural performances. 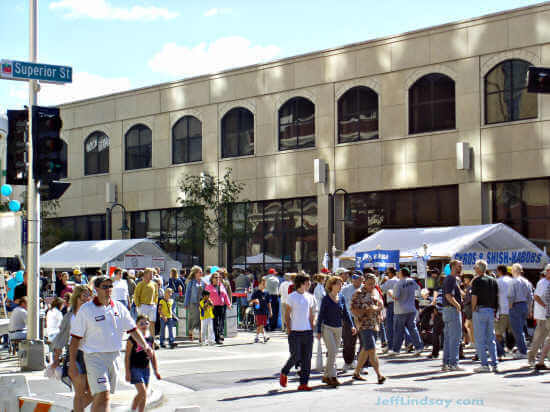 In front of City Center Plaza at the heart of Appleton's downtown. 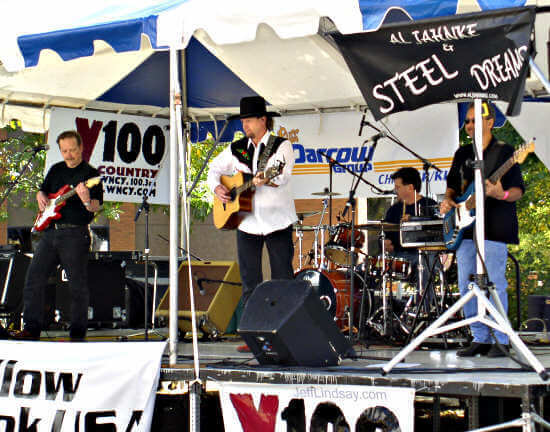 Wisconsin's own Al Jahnke and Steel Dreams performs for an enthusiastic crown. 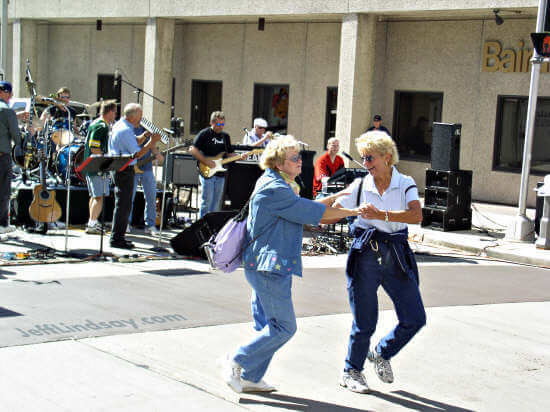 A rock band performs for a large crowd (not shown) at the side of the Performing Arts Center. 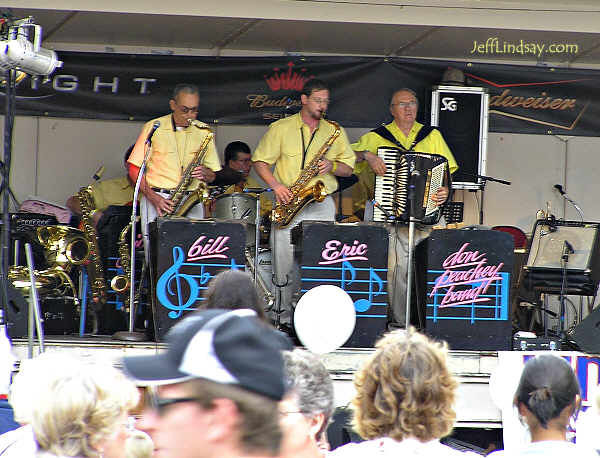 There were several spontaneous outbreaks of polka at Octoberfest, partly fomented by overt polka music from one band. But really, who can resist such temptation? This was just east of the Radisson Paper Valley Hotel. 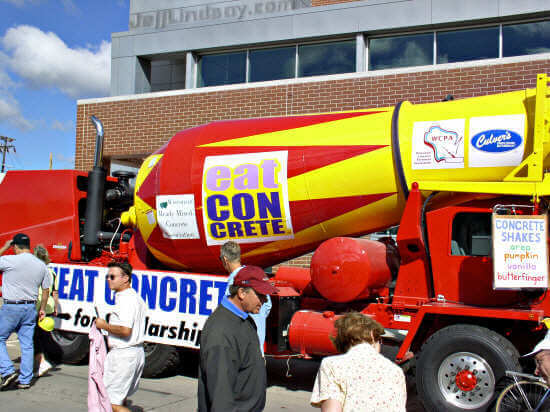 Eat concrete for scholarships? That's what the sign on the truck says. Sounds like something for civil engineers at UW-Madison. Turns out that "concrete" is just a species of frozen custard from Culvers. 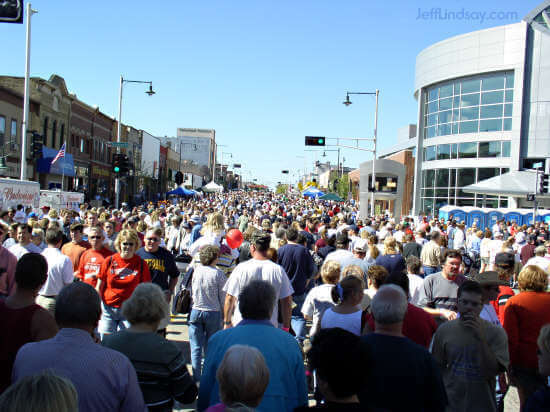 Another view of the thronging humanity that filled College Avenue. A scene in front of a bank on College Avenue. It wasn't all pork and tiger paws. 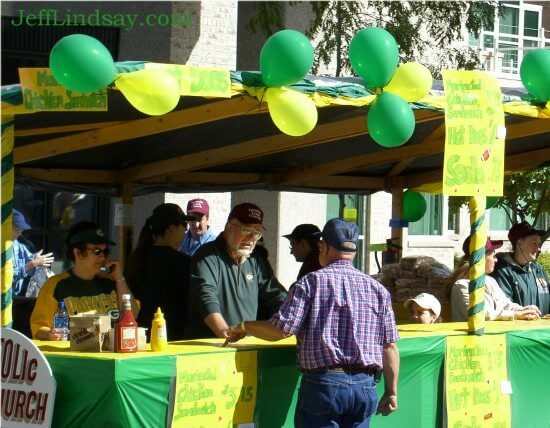 Greek food seemed to be selling well at Octoberfest. Normally I shy away from anything named booyah, except perhaps on Halloween. But the staff from Gill Tech's Academy of Hair Design were so persuasive that I couldn't resist. Definitely the best booyah I've ever had. Turns out to be a delicious stew, somewhat reminiscent of gumbo, but with more of a booyah flavor. And it was probably the healthiest thing I are at Octoberfest. 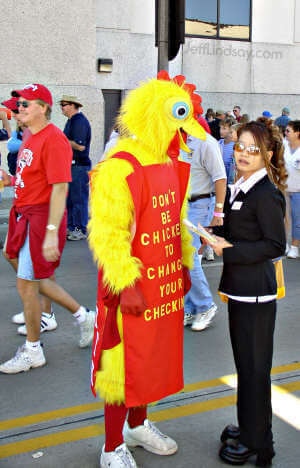 From the chic to the chicken, Octoberfest has it all. Creation date: Sept. 27, 2004.